Supernatural focuses on the Men of Letters as a threat when they start their mission to kill all of the American Hunters. This is actually a really big story and I’m surprised that the writers chose to deal with it so quickly. The systematic killing of the American Hunters is something we knew was coming but Sam and Dean didn’t so it plays out as a bit of a mystery while also not being one. I often find it tedious waiting for Sam and Dean to catch up with what the audience knows and there was an element of that in this episode. The cold open showing Eileen being chased down by a Hell Hound that mauls and kill her was actually really effective. It does a complete disservice to Eileen who deserved more than being killed off in the same way an anonymous victim to set up the episode would be. Ideally an episode featuring her death would have that be the focus rather than it simply being just another thing that’s going on. It fades into the background shortly after it happens and that’s definitely the wrong way to handle an established character who has been prominent in more than one episode. Sam and Dean did seem somewhat upset about it but there should have been more to it than that. This episode actually has this problem throughout. It’s full of potential that is never quite met. 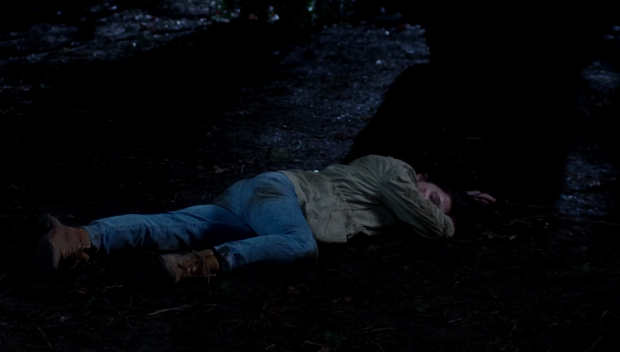 The handling of Eileen’s death is one of them and the other major one that stands out is the treatment of Mary. There is a scene designed to shock where she visits a fellow Hunter under false pretences but it doesn’t work because why else would she be there? The context of the story doesn’t really give a lot of other options so her attack isn’t really a surprise. The reconditioning was expected otherwise she wouldn’t be let out so a potentially surprising moment was ruined by showing the solution before suggesting there was a mystery. Mary being reconditioned could and should have provided enough material to fill an episode by itself. It could have been a brutal showing of a strong willed person being deconstructed and recreated in the image of the Men of Letters. We have seen all season how capable she is while having certain vulnerabilities. Sam and Dean could be counted as a weakness of hers as she will do pretty much anything to protect them. This could have been the key to breaking her and we’ve already seen that the Men of Letters can create fantasy scenarios because Toni did so with Sam back in “Mamma Mia“. Obviously I don’t know what is planned for the finale but I don’t really buy into Mary’s turn to the dark side. Her treatment at the hands of Toni seems to be consistent with the Men of Letters’ recruitment strategy. We already saw some of Mick’s backstory and there’s plenty of mention of what Toni and Ketch went through in order to be considered worthy. Dr. Hess is definitely a brutal taskmaster and it seems that the Men of Letters focus more on bending people to their will rather than inspiring loyalty. I get the impression that Mick was trying to create respect and loyalty between him and the Hunters but it seems to be a really unique viewpoint judging by everything that we see here. I suspect that might end up being significant at the end of the season. Toni certainly seems to be questioning her position in a big way and there’s an overall sense that the Men of Letters is starting to crumble. Ketch isn’t entirely happy with the current role he has because he feels that the work he has done is worth more than he’s getting in return. Dr. Hess likely can’t hold onto her position of power for much longer and I imagine there’s a betrayal coming. Not that I see Ketch or Toni completely siding with the Winchesters but they could mould the organisation in their own way that has no interest in the American Hunters. Dr. Hess seems to be a bit of a hypocrite. She makes clandestine deals with Crowley to leave his Demons alone in exchange for them looking the other way when people make deals with them. It’s a strange arrangement but it adds some complexity to the organisation. Crowley’s forces are in theory strong enough to tear them apart so some reason has to be provided for why Crowley doesn’t just arrange for that to happen. I also like to see Crowley as a compromising leader who makes unpopular decisions for the greater good -or greater bad- of those he is in charge of. One of the highlights of the episode was the gun fight in the Bunker. It was well shot, appropriately tense and showed how skilled Sam and Dean are in combat. It allowed all of the characters to be skilled and capable without anyone making stupid mistakes to further the plot. I really liked how Dean used his knowledge of the layout to get the drop on Ketch and turn the tables in their favour. 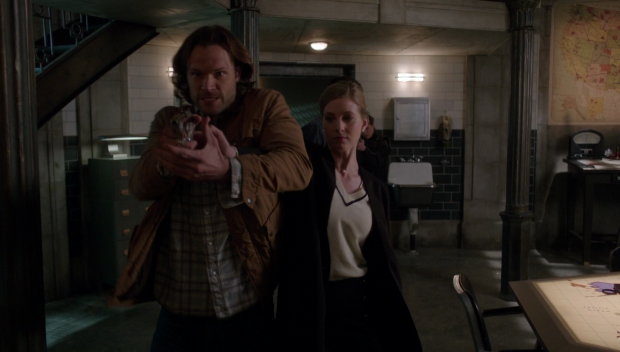 Of course Ketch had Mary as his secret weapon which was enough to throw Sam and Dean off their game. It was an effective reveal despite how questionably her transition was handled. Ketch monologuing about his plan like an Austin Powers villain before betraying Toni, cutting off their air supply and leaving them for dead in the Bunker was not good either. There’s no reason Ketch couldn’t have killed them all. Obviously Sam and Dean can’t die -even though they both have multiple times- and this gives them a problem to solve in order to survive but it felt like such an artificial way to increase tension. Ketch has always been established as cold, calculating and effective so leaving them alive felt like something he would never do. It’s a shame when characters are so poorly represented. Sam and Dean were allowed to be shown as intelligent and experienced. Their exhaustive search of the Bunker which led them to discover the microphone under the desk was nicely handled as they had a reason to suspect that something was up and acted on it. Using the microphone to their advantage was an act worthy of their years of experience an allowed them to turn a disadvantage into a temporary advantage. Getting the drop on Toni only let them in on the plan which gives them some chance to find a way to stop it or warn the Hunters they know but it seems that the Men of letters have been busy crossing names off their long list. 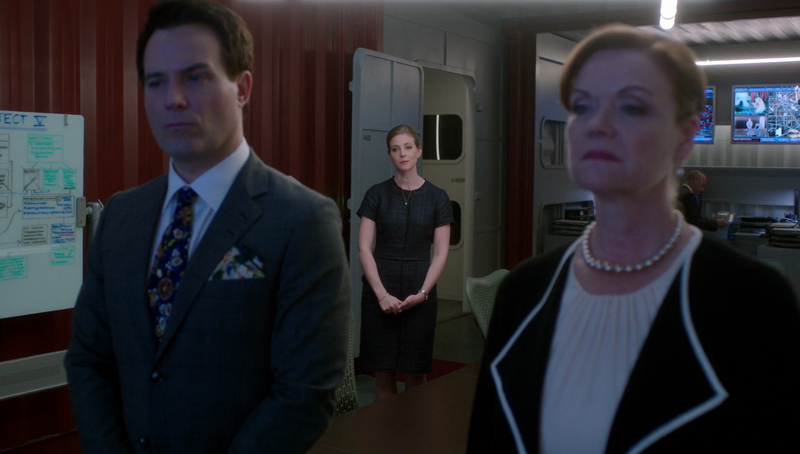 I refuse to believe that Jody Mills or Claire Novak will be killed off using a single line in an episode they don’t appear. Hopefully the writers have more respect for those characters than that. I really liked the movement on Lucifer’s return to grace. The reversal of Crowley’s trap was clever and it was a satisfying way for Lucifer to turn the tables on him. Mark Pellegrino is incredible in the scenes where he casually toys with him and Mark Sheppard playing Crowley as somewhat pathetic and defeated was a solid counter to that. Crowley’s attempt to at least be allowed to hang around in a reduced role while Lucifer tackles the “big picture” was very in character for him and Lucifer deciding to do away with him made more sense than him agreeing to it. Lucifer stabbing Crowley’s vessel with the Angel Blade might have had some shock value to it if it wasn’t so obvious that he had possessed the Rat before that happened. It wasn’t bad but it was laughably obvious. It is incredibly satisfying to see Lucifer on top as he has always been a prisoner in one way or another so this is the first time we’ve really seen him at full strength outside of possessing Sam in “Swan Song“. There is a lot that can be done with this but I’m hopeful that it will be left until next season as there just isn’t enough time left in season 12 to cover all the lingering plot threads. An episode full of missed opportunities and hints at better stories. The focus here really should have been on Toni or Ketch breaking Mary Winchester as her transition to the dark side feels far too rushed to be believable. It would definitely increase the threat value as we know how strong willed Mary is and would allow some further insight into her vulnerabilities. Another missed opportunity was the death of Eileen that was completely mishandled in a way that does disservice to her character. 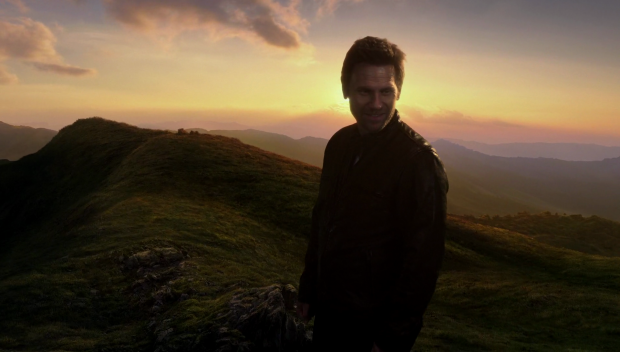 The suggestion that the Men of Letters is starting to unravel because of the lack of real loyalty between them and the growing dissatisfaction shown by Ketch as well as Toni is interesting and I like the reveal that Dr. Hess is something of a hypocrite thanks to her partnership with Crowley. One of the highlights of the episode was the showdown in the Bunker. It showed Sam and Dean as both skilled and intelligent with the arrival of Mary serving as a believable way to turn the tables. Ketch betraying Toni, cutting off their air and locking them inside to leave them for dead felt out of character for him as he has always been someone who makes sure he takes care of the problem rather than risking it coming back. Lucifer’s return to grace was handled well and it was satisfying to see him turn the tables on Crowley while taking joy in completely reversing the trap. Crowley begging to be allowed to hang around was also a nice touch as was Lucifer’s lack of willingness to do that. The “death” of Crowley wasn’t all that tense as it was obvious what he did to escape. It’s good to see Lucifer on top and will hopefully play into next season more significantly.